Product Size: Dimensions:18.1 x 12.2 x 5.5 inch,This laptop backpack is made of durable polyester fabric with dual metal zippers, scratch-resistant, anti-tear, and water splashing resistant. Superior Material: Water resistant High-quality canvas with complete lining, load-bearing but lightweight. Padded shoulder straps are wide with high permeability material, decreasing pressure of shoulder and neck, and keeping cool when you carry it for a long time. 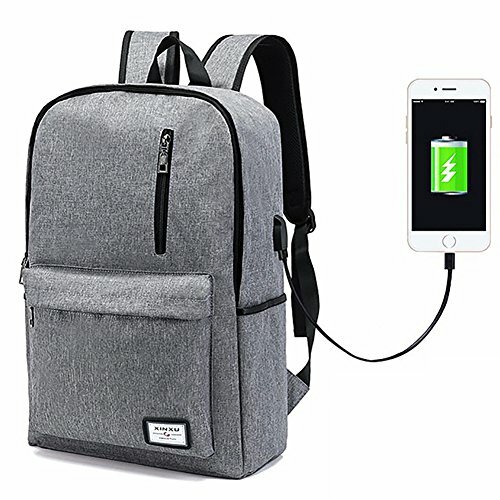 Exteral USB design: With a USB 3.0 charging port extended on the shoulder strap of the backpack and built-in charging cable inside, this USB backpack provides more convenience to charge your phone, tablet or laptop. Please noted that this backpack doesn't power itself; the USB charging port only offers easy access to charge your devices. Roomy Capacity: The backpack main compartment features a padded sleeve holds up to 15 inch laptop and several-compartment design provides large and expandable space to keep ample items well organized. We love our customers and 180 days warranty provided. If any problem, please contact us firstly and our customer service will solve it for you soon. If you have any questions about this product by Aviling, contact us by completing and submitting the form below. If you are looking for a specif part number, please include it with your message.